Hi, my name is Brock Albaugh. I am 13-years old and the nephew of Kurt. I live in Carrollton, Ohio, which is a very small town in eastern Ohio but has lots of woods to deer hunt in. I have a giant passion for hunting. If I am not deer hunting, I am rabbit hunting with my beagle, Abbie. I am always outside doing something and I love the outdoors. My Uncle Kurt wanted me to share my story. 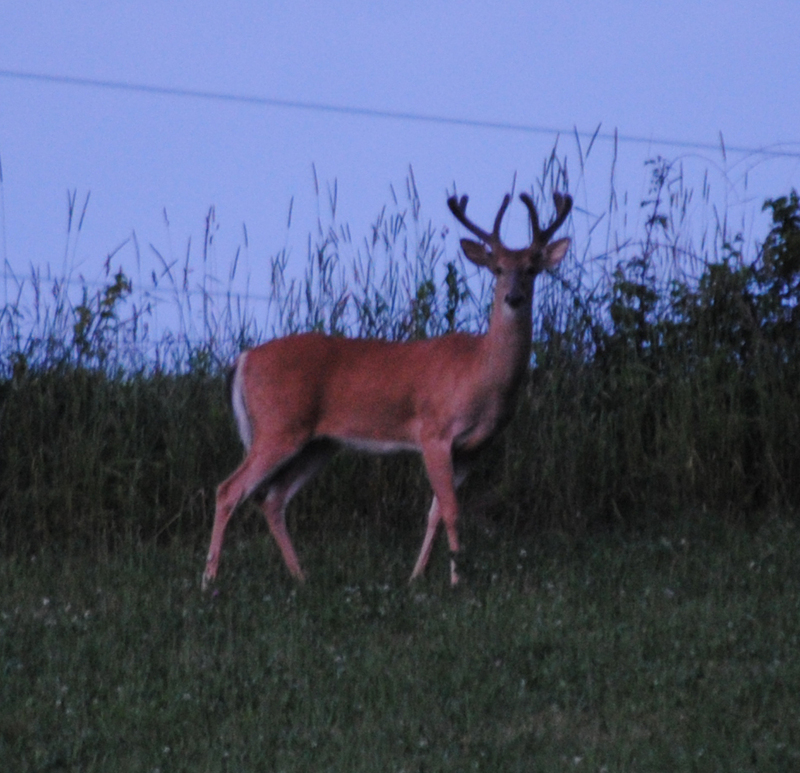 It all started on May 24, 2011 when I was outside and saw this deer in a hayfield across the road from my house. 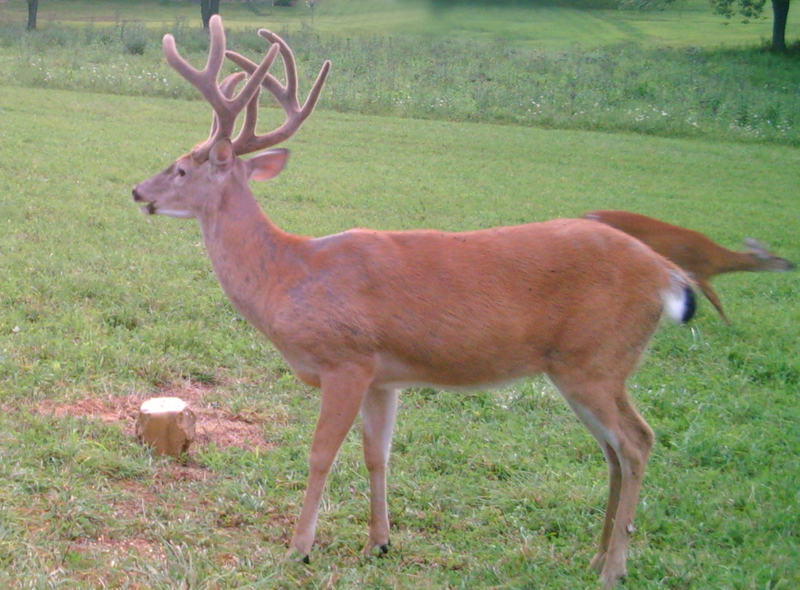 I got a picture of it and was ready for the Ohio Whitetail archery season to start. The deer was coming out every night that week, so my dad, Jeff, and I decided to put a corn pile out in front of a trail camera to see if we could get any good pictures and videos, and we did. We watched the deer all summer and was able to watch it grow into the deer that I would shoot. My friend, Kory Host, and I were able to shoot a couple of good videos of the buck earlier in the year while it was eating in the hay field. 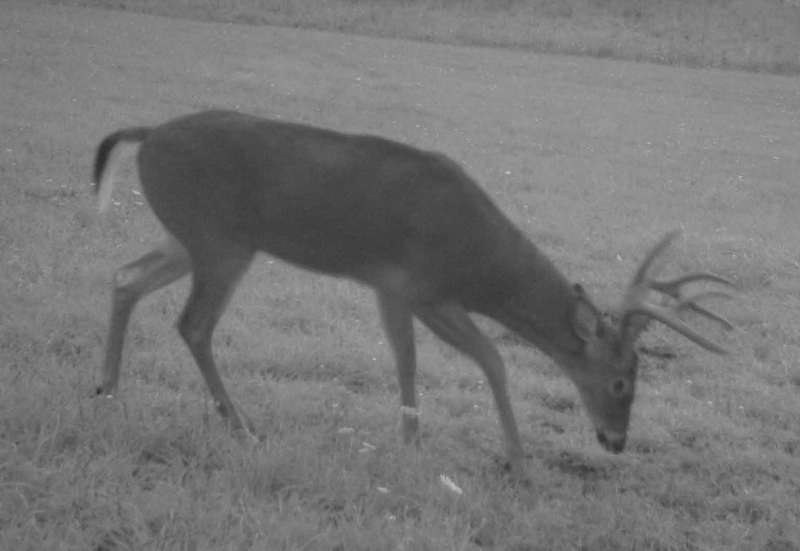 The videos were very cool, but the buck was only about halfway done growing his antlers, so he was not as big. 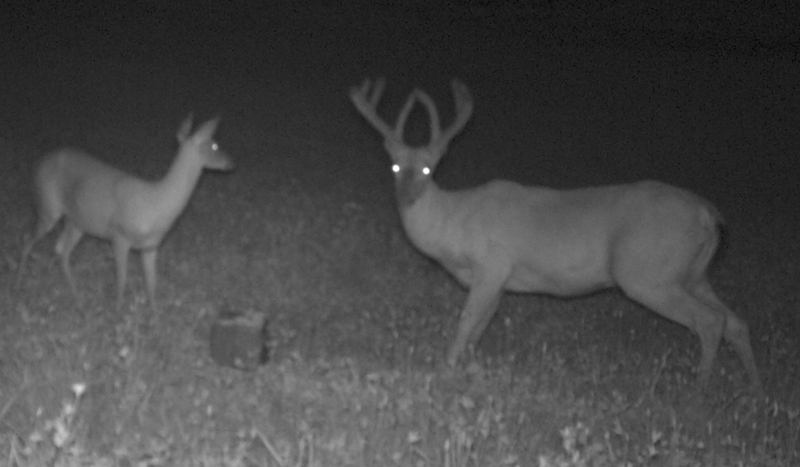 Since that day in May, the buck came out in the same field just about every night to get some food before it would disappear into the woods, but still come out the next night for the same routine. This deer has not just been around my house this year, it was also around last year too. 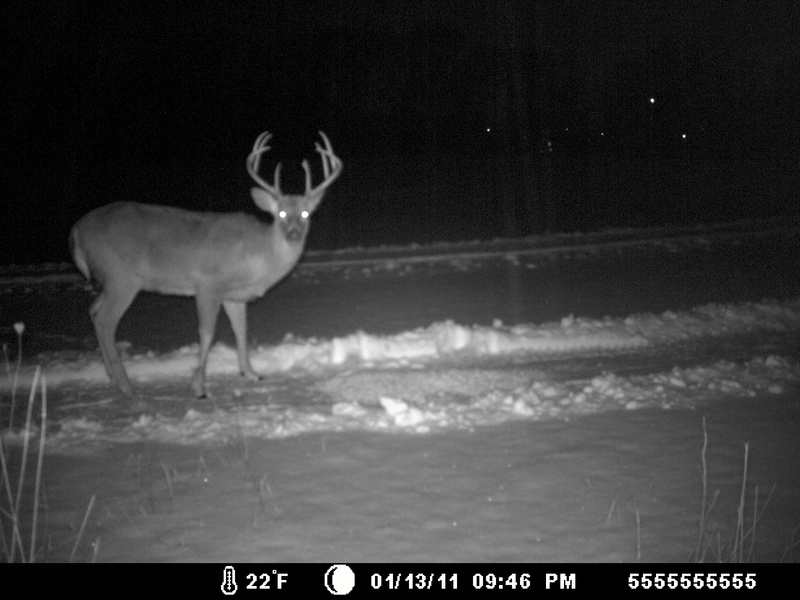 The first time we saw him was in the beginning of December, 2010, right before I shot my deer last year. I know it’s this deer because of the big brow tines the deer beholds. All winter we were getting trail camera pictures of the deer eating in front of the trail cameras. I was just hoping that it would stay around until this hunting season so I could hunt it. Luckily, he did just that. Our 2010 was a very bad winter which caused the deer to try to find food in the most unusual of places. It was so bad that the deer came out of the woods and were eating corn out of a cardboard box in our front yard. Deer would come every night to our front yard to eat the corn in front of our house. We decided to put the trail camera on a tree in our front yard to see what deer would come in the middle of the night, and I did not believe it but a few bucks were coming and eating the corn. Then, at 12:30 a.m. on Christmas morning, this buck appeared across the road and came into our front yard to eat some corn while we were standing in the picture window watching him. He ate corn for about 15 minutes then walked back across the road and into the woods. It was a very cool experience and doubled my hopes of getting this deer the next year, and lo and behold, I did! So you are probably wondering about the actual hunt! Well, here is the story. 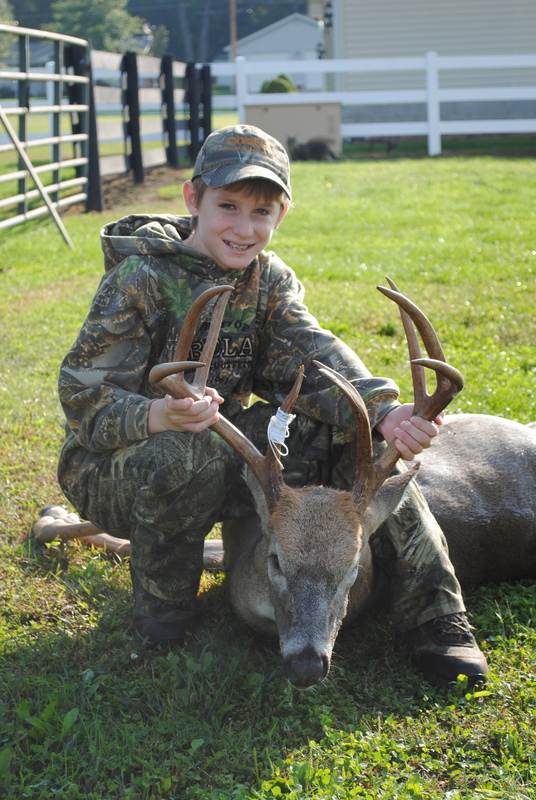 On September 24, 2011, the first day of Ohio archery season, I was extremely excited to go hunting for the first time in a couple of months but did not expect that I would shoot this deer later in the day. My dad and I went hunting in the morning on some private Ohio property and saw a few small bucks, but nothing worthy of shooting. 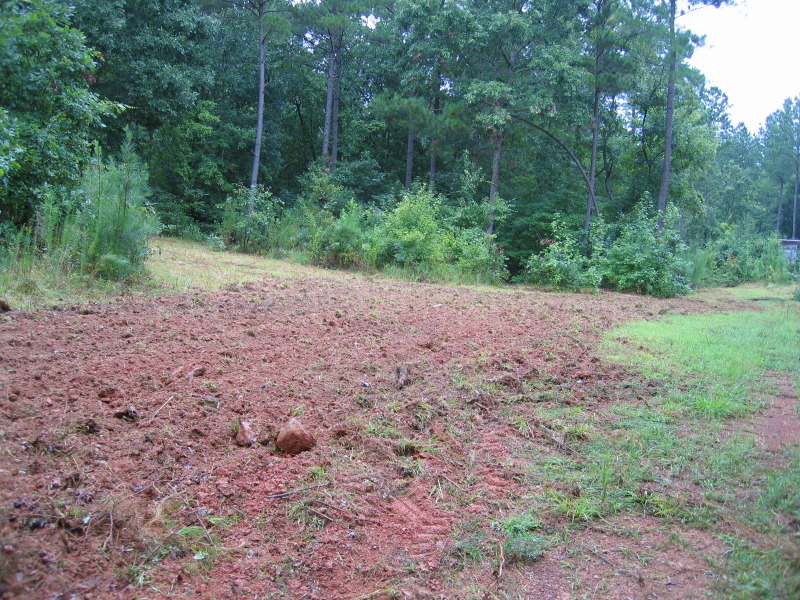 Once we came home, I decided that I wanted to go hunting across the road on the edge of the woods by the hay field in my ground blind. So a few hours earlier in the day, my Dad and I went over to try and hide the ground blind a little better than it was and put oak branches (with the leaves still on them) in the field to show me how far away the deer are. We did that and then returned to my house until it was time for me to go hunting. It was around 6:00 p.m. when I decided that it was time to go over and sit until dark. I put on my black clothes, since the inside of the blind is black, grabbed my crossbow and headed for the blind. It took about an hour until the action started. About 8 or 9 does and a few fawns came out of the woods and into the field about 25 yards from my blind to eat. Then about 20 minutes later, I saw this deer’s antlers peak over the hill, and come in my direction. I was excited, but not too excited because when I had to shoot, I did not want to be shaking like a leaf. Once he came down toward my blind, I hoped that he would give me a shot. The buck came running down by my blind at a very fast pace only 20 yards away, but he was moving too fast to shoot. Then he stopped 25 yards away, but he stopped in the worst position for a hunter, and I am sure that this has happened to you. The deer came down and stopped with his rear-end facing directly in my direction. All I could do was sit there with my crossbow and watch this deer eat right in front of me. It was pretty bad, but I knew that I could not get nervous, so I stayed calm. Then the worst thing almost happened. The deer started to walk straight back up the hill with his rear-end still facing me, I thought that I would not get a shot and have to watch him walk up the hill. But all of a sudden the whole scenario changed. He turned and walked right over to the oak branches that my dad stuck in the ground and started eating the leaves while standing broadside. This is when I knew that I had to shoot, or it could be my last chance. So as the deer was eating my thirty-yard marker, I pulled the trigger. Once I pulled trigger the arrow went on the longest 30 yard flight I think I will ever feel. To me, that 30 yards seemed like it took the arrow and the broadhead more than a minute to hit the deer. But once the arrow hit, a loud thump was heard and the deer almost did a front flip when it kicked his feet in the air. The deer took off running, jumped a fence, then fell only 50 yards from where I shot it. As the buck fell, which I could see it, I got a rush of adrenaline knowing that I had shot a nice trophy buck. I called my dad and told him that I got it and he was excited, and I mean very excited. We let the deer lay for about 30 minutes, then went after it. The deer was down and had holes coming out both sides of its body from the arrow and broadhead, I suppose that I double lung shot the deer since it went down so fast. I was very excited with this deer in my hands knowing that it is a trophy. My favorite characteristic is the brow tines that the deer has. I think that is very cool that they are so long and the tips almost touch each other. Once the field dressing and pictures were done it was time to go back to the house. We then put ice in the deer, covered it with a tarp and it was time to go inside so I could tell my dad the whole story. When I told him, he was very happy for me. But my dad did ask me one question, he said, “Brock, why were you so calm when I came to get you on the four wheeler, it seemed like you were not excited about shooting the deer?” So I replied by saying, “ The deer I shot last year was a little bigger, so I was not going to get too excited over shooting a smaller deer.” He still cannot get over how calm I was when he came to pick me up. When we went to the butcher shop to pick up the head to take to the taxidermist, one of the butchers told me that the deer weighed 200 pounds, field dressed. I could tell it because it was very hard to get the deer from the ground to the truck. I know that you might think I am crazy, due to the fact I am a young hunter, but I actually would have let that deer grow another year or two so it could grow to become a real trophy. But due to the fact that the deer lived very close to a busy highway and had other hunters were hunting in the same general area, I knew that I should take advantage of this chance and shoot him. It was also hard to shoot it knowing that it is smaller than the buck I shot last year too because I did not want to shoot a deer smaller than that one, which scored 144 inches and made the Ohio Big Buck Club record book. field on September 24, 2011 is very cool. Not many people, even adults, get the chance to watch a deer grow like this then shoot it in the same season, but I am one luck kid that did get that exact experience! Editor’s Note: I’m very proud of Brock. First, for the way he’s handled taking two deer in successive years that most (yes, most) hunters never get a chance to take in their hunting careers. I’m also proud of him for taking the time to write a great story to share his experience with our readers. He’s got the hunting bug, and that makes his uncle (who happens to suffer from that same illness!) pretty darn excited! I’m lucky that I have nieces and nephews – and hopefully a couple kids when they are old enough – that enjoy the outdoors. Here’s looking forward to sharing the woods and waters with Brock, and the rest of my family, for decades to come. 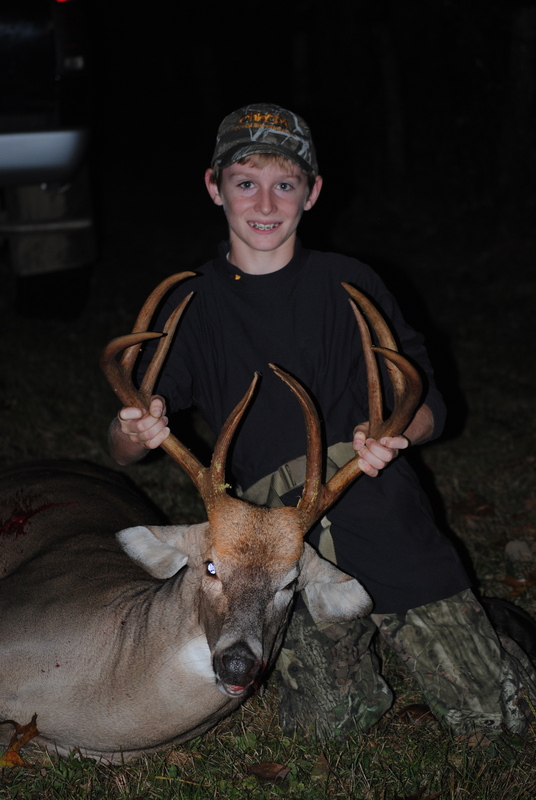 To read about Brock’s 2010 144″ monster, click here. The lens through which a hunter looks at the outdoors changes quite a bit when he or she is a parent. The endless hours of daydreaming about your own success afield is replaced with thoughts of sharing the woods and waters with your kids. Heck, my daughter is probably a decade away from hunting and I’m already thinking about those days to come. Richard Faulkner has three sons. And his oldest, Nate, is joining Richard next week for his annual pilgrimage to North Dakota. At 12-years old, Nate has caught hold of the hunting bug pretty hard. And while that’s truly awesome, what makes it equally fun is to witness how excited his dad gets when he gets to share the outdoors with Nate. So AHuntersTales is going along with the father-son duo. In addition to enjoying the time hunting ducks, I’m going to document as much of Nate’s first out-of-state hunt as possible with video and still cameras. The outcome will be a series of blog entries documenting the memories for both Richard and Nate. It should be a lot of fun. We’re planning to be in North Dakota for the opener next week. Posts should start shortly thereafter. 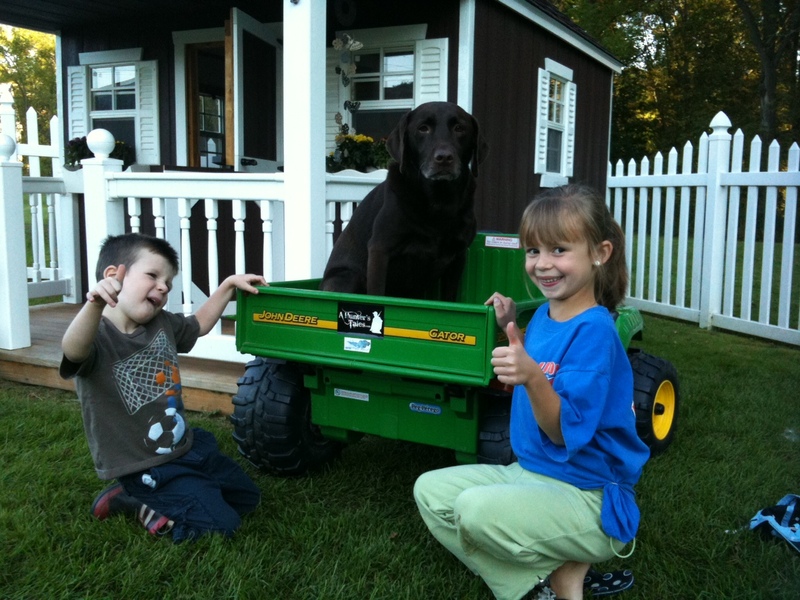 Check out the picture of AHT contributor Greg Johnston’s kids proudly displaying their AHT sticker on the back of their John Deere Gator! Thanks for the support Jilli and Blakester (now, go tell all your friends at school to check out the blog)! The “report” he promised wasn’t good. Turns out it continues to get worse in Montana. Call it blue tongue, call it EHD, it doesn’t matter what you call it – its outcome is devastating. Blue tongue, or epizootic hemorrhagic disease, appears to be the culprit. And the aftermath of it, once complete, appear to be headed toward near disaster for the whitetail deer herd in many areas of the state. 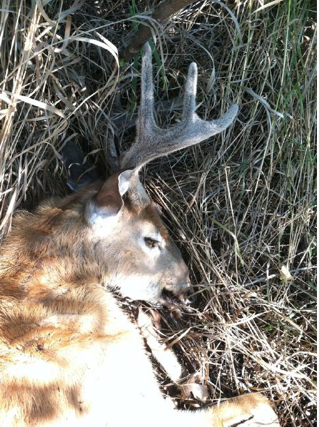 Waddell reported, via Twitter, seeing only “10 to 18 deer where we typically see 100.” That report, coupled with many outfitters accounts along the famous Milk River have numbers pegged at between 80-90 percent decimation. That’s extremely sad for a state that has been quickly becoming a favorite destination for whitetail enthusiasts. That also puts numbers where there probably should be little hunter harvest for the next several years to allow for rebound. It will take plenty of time, based on what I’m reading. First Blue Tongue and EHD, by definition, are different. Blue Tongue is really the sister disease that affects livestock. Regardless, in it’s most slang sense, hunters know what it means. It’s a contagious virus affecting deer and is spread by gnats. It is most found near waterways and standing water encourages its spread. While most biologists recommend you discard the carcass of a dead animal found with questionable symptoms, there are no known spreads of the disease to humans. You’ll likely be seeing more about the actual outbreak in Montana in the coming months (I’m sure whitetail magazines are gearing up coverage), however the true impact of its destruction will surely be felt by hunters in that region for many, many years to come. That’s tough – especially for someone who has long dreamed about glassing those endless prairies for a Milk River whitetail to put a strategy to. I wish the herd, and the hunters impacted, the best.